The Elefun & Friends collection, which includes Elefun, Hungry Hungry Hippos, and Gator Golf, provides a great way for parents and their kids to enjoy silly, active playtime together. We received SCATTERPILLAR SCRAMBLE and GIRAFFALAFF LIMBO. The kids started out with Scramble and then went to Limbo and then came back to Scramble. Both games are for kids 4 years old and up. 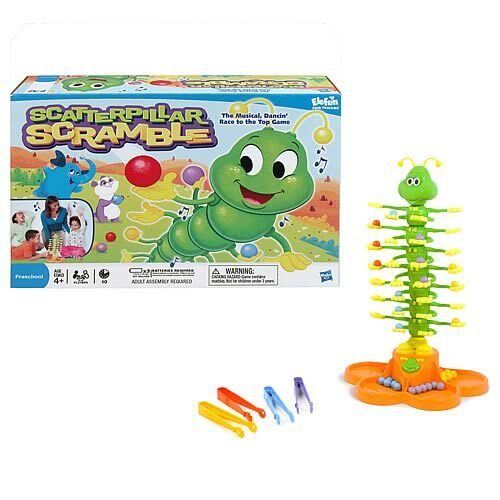 In SCATTERPILLAR SCRAMBLE kids do their best to balance marbles in the hands of one very wiggly caterpillar. Kids have fun dancing along to the music with Scatterpillar in this fast-paced marble game. The first player to securely place all 8 marbles in Scatterpillar’s hands wins. SCATTERPILLAR SCRAMBLE was named the 2009 Preschool Game of the Year by Creative Child Magazine. Burke and Marjorie started out with this one…and quickly got frustrated because the Scatterpillar moves so much. However, they did come back to it when we talked about how it takes practice and that if they kept at it they’d be able to do the game in no time. I think part of their frustration was that the marbles would get away from them. Mike fixed this by putting the Scatterpillar in a box top – no more runaway marbles! As the kids practiced, they actually got pretty good at it. They never really played the game, but they had fun putting marbles in Scatterpillar’s hands. I liked this game because it teaches kid persistence and hand-eye coordination. It’s also fun to watch the Scatterpillar dance around. 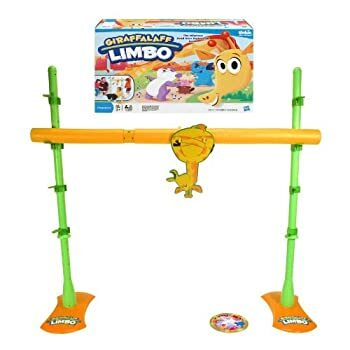 GIRAFFALAFF LIMBO is the crazy new game of “how low can you go?” Spin the dial to try one of the 6 limbo styles: classic limbo, crab walk, crawl, giraffe walk, bend forward or backward. The game’s built-in sound will play an encouraging song as preschoolers try not to bump into Giraffalaff. If he’s knocked over, he´ll roll on the floor in laughter. The player who passes under Giraffalaff at the lowest level wins. Burke and Marjorie had fun running around and ducking under the giraffe, but didn’t quite get the “spin and do the funny walk” part of the game. We’re working on that. They were really digging the music though – and doing well taking turns walking under. Now for the Giveaway part. Would you like your own Giraffalaff Limbo and Scatterpillar Scramble games to enjoy? There are multiple ways to enter – you do not have to do all of them to be entered! You have until Midnight on Monday, October 12th to enter. Random.org will choose the winner and I’ll post it on Tuesday the 13th. Once you’ve purchased (or won!) an Elefun & Friends game, Kids can also experience the fantasy world of Elefun & Friends online by visiting www.elefunandfriends.com and entering the special code that can be found inside each Elefun & Friends game box. Once the code is entered, kids can access The Tangled Tale, an Elefun & Friends animated short. This entertaining tale features Elefun on an adventure to untangle a kite string, which ultimately leads him to the true meaning of friendship. The Elefun & Friends online experience also lets kids play games and sing along to songs like “Friends’ til the End” and “Follow that String” that help remind children of the importance of fun and play! Coupon, Coupon, Coupon: visit http://bricks.coupons.com/bstart.asp?o=59048&c=EL&p=ERf0P5lm to download a printable coupon for $4 off any Elefun & Friends game! This valuable coupon offer is valid until December 31, but it´s only available for download through October 31. How awesome! The kiddos look like they had a blast testing the games! My favorite toy is dress up clothes (does that qualify as a toy?) since it just makes for lots of funny pics and laughter. Katie’s favorite toys right now are barbies and anything to do with doctors. Timmy’s favorite toy right now is anything with wheels. Or anything long that he can grasp and bang stuff with. Apparently, a wiffle ball pat is PERFECT! Tweeted! Can you believe I was JUST looking at these at the store yesterday?!?! Almost bought & then decided to wait in case they went on sale. JUST saw these games at Target yesterday and almost bought one & amazingly can win one over & Zimmer Zoo http://bit.ly/GGK4v Hooray! MY favorite kids toy is play-doh. great stress relief and involves almost no actual creative SKILLS, just imagination! My KIDS’ favorite toy, their train table. all four of them love it. Although, they enjoy doing different things so it makes it hard for them to use it together. My daughters favorite toys are her Build A Bears! She has 21 and enjoys dressing them! I love the game Operation! When I was a kid, my favorite toy was the “Connect 4” game. It was like Tetris before Nintendo. It was a game at a young age I could play with older kids, which I was always trying to do. I also LOVED the Transformers toys…. Ellery is in a baby doll craze. She loves to feed them, rock them, put them to bed. Her imaginary “friend” is Diego and she pretends that the baby is hers and Diego’s. Yeah, I know. Wesley loves to play with balls right now. Now that he can walk really well, he loves to throw it and then chase after it.